Winter Island, now connected to the mainland in Salem, has had a colorful history. It was the site of eighteenth century Fort Pickering, much of which still survives. The island's Execution Hill was the scene of several hangings in the 1800. Winter Island also served as a militia training ground, and in the late 1800s, an amusement park called Salem Willows grew up nearby. Fort Pickering Light was established in 1871, the same year as Derby Wharf Light in Salem Harbor and Hospital Point Light in nearby Beverly. For many years before, Baker's Island's twin lights had served as the only guides to the harbor. With the addition of the new lights, mariners would line up Fort Pickering and Derby Wharf Lights after passing Baker's Island on their way into Salem Harbor. 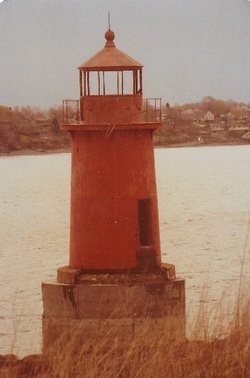 The lighthouse was built of cast iron lined with brick, and it exhibited a flashing white light 28 feet above sea level. Circa late 1800s. U.S. Coast Guard. The lighthouse tower, originally painted red, was built slightly offshore. A walkway connected it to the shore. John Harris, an Ipswich native and Civil War veteran, became keeper in December 1882. On the occasion of his retirement in 1919, when he was 75 years old, it was reported that Harris had been absent from the lighthouse for only five nights in 37 years. He ventured only occasionally into the city, about two miles away, for supplies. Harris often rode his horse, which had reached the ripe old age of 28 in 1919, into the city. Until his retirement, he never saw the streets of Salem after dark, and he never rode in a car. "It seems as though we have been out of the world for a long time, " he said, "and it will take some time for us to learn how to act among people." On the night he retired, Harris attended his first motion picture. A Coast Guard airplane hangar was erected on Winter Island in 1934. The Coast Guardsmen lived temporarily in the lighthouse keeper's house until new quarters could be built. In January 1934, a blizzard imprisoned 30 men in the house until a plow could get through. Their heating fuel had just about run out with temperatures dipping to 12 below zero. The lighthouse keeper's house later became the officers' club for the Coast Guard's Air Station Salem on Winter Island. In 1944, Air Station Salem was officially designated the first Air-Sea Rescue station on the eastern seaboard. Right: The keeper's house in the late 1800s. The keeper in the photo is probably John Harris. U.S. Coast Guard. The Coast Guard left Winter Island in 1969, and at the same time the lighthouse was replaced by an offshore buoy. With no one watching out for it the old tower soon fell into disrepair. The infamous blizzard of 1978 took the door right off the tower and it remained underwater for several years. A group of concerned citizens and businesses formed the Fort Pickering Light Association in the early 1980s. They fished the door out of the harbor and put it back on the lighthouse. The lighthouse was refurbished and the foundation was repaired, and Fort Pickering Light was relighted in 1983 as a private aid to navigation. The lighthouse went dark for a few months in early 1995 when conduit erosion cut off the power supply from shore. It was converted to solar power in April 1995, with a white flash of four-tenths of a second every four seconds. The $2,300 cost of the new light was split by the City of Salem and the Fort Pickering Light Association. The lighthouse received a facelift in 1999, thanks to a community development block grant. The American Steeple Corporation of Salem, which had previously restored Boston's Old North Church and Quincy's Church of the Presidents, completed $13,800 worth of iron work repairs, painting and lantern glass replacement. Salem Mayor Stanley J. Usovicz said, "The time has come to focus the care and attention on Winter Island that will help restore luster to one of Salem's priceless jewels. The work on this important navigational aid is one such effort." Gary Moore, former manager of Winter Island Marine Park, has called the lighthouse Salem's "Motif No.1," and it is certainly a favorite of photographers and painters. It's easy to drive to Winter Island and there's plenty of parking. There are campsites for recreational vehicles, a boat launch, picnic areas, a bath house, and a short beach dubbed Waikiki Beach when the Coast Guard was on the island. A visit here makes a pleasant trip in combination with nearby Salem Willows Park, a great spot for picnicking and strolling by the water.